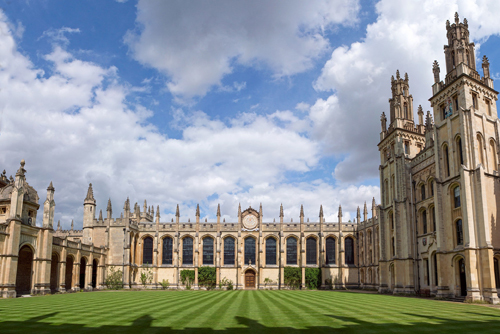 Executive Alarms has installed ACT access control equipment at All Souls College, University of Oxford. All Souls is benefiting from the latest version of ACT’s management software, ACTenterprise. This is a role-based platform with functionality available to users according to their specific needs (e.g. installer, security guard, system administrator) and which offers operators the look and feel of a web browser experience. Fellows and staff at the College are using ACT’s own contactless smart cards with the ACTpro MIFARE 1030 proximity reader. Crucially, this is a slim-line mullion reader and for the All Souls project, ACT used their 1030PM brass finish (usually associated with audio entry panels) and designed a flush plate in solid brass that is fitted to walls near doorways in order to blend with stone dressings that can date back to 1440. The ACTpro 1520 single-door IP controllers used here are expandable up to 32 doors through use of ACT door stations. ACT’s range of door stations offers break glass monitoring, reader short circuit protection, voltage monitoring and anti-passback. Faults are reported on a web interface and the ACTenterprise software.